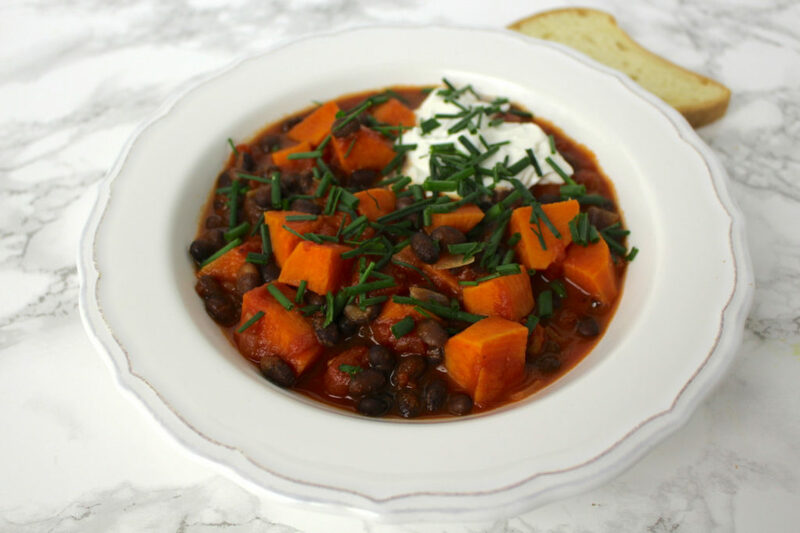 This vegan sweet potato & black bean stew is very easy to make, satisfying and comforting during cold weather. It’s super inexpensive, packed with nutrients and flavor. Serve with some rice or any other grain, some fresh herbs and a dollop of this irresistible (but healthy) vegan sour cream. You can always adapt this recipe to use what you have. 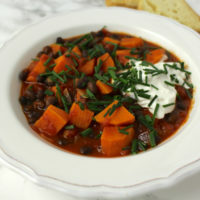 Swap the sweet potatoes with potatoes or squash and the black beans for lentils or other beans. 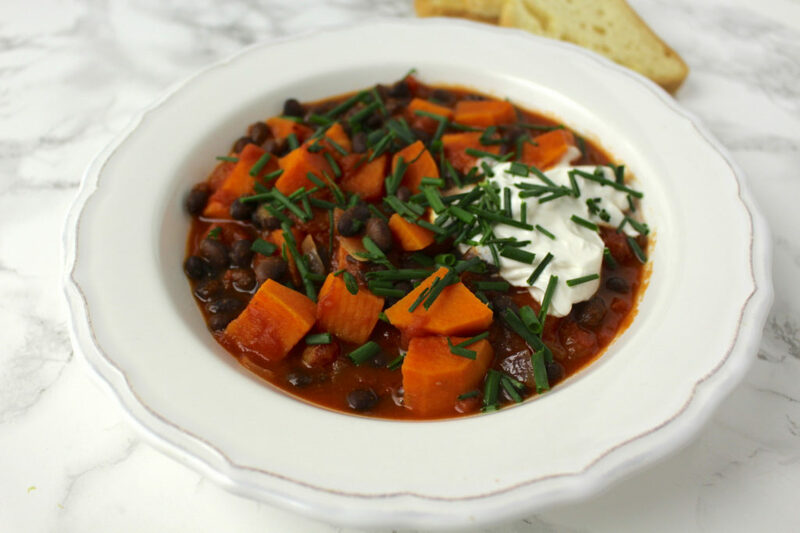 This sweet potato & black bean stew is very easy to make, satisfying and comforting during cold weather. It's super inexpensive, packed with nutrients and flavor. Serve with some rice or any other grain, some fresh herbs and a dollop of this irresistible (but healthy) vegan sour cream. Peel and chop sweet potato. Dice onion and garlic. Heat a large pot on a medium heat with oil, onion and garlic and fry for a few minutes. Add sweet potato and all the spices (chili, turmeric, paprika and cayenne) and fry together for a few minutes, stirring occasionally. Add tomatoes and veggie stock, mix together and bring to a boil. Then reduce to a low heat, place lid on the pot and let cook for about 15-20 minutes until the sweet potatoes are cooked. Drain beans and add to the pot. Season with salt & pepper, take off the heat and let sit for another 5 minutes. Serve with rice/ quinoa/ millet, fresh herbs and sour cream. Optional, but highly recommended: serve with a dollop of this delicious vegan sour cream. 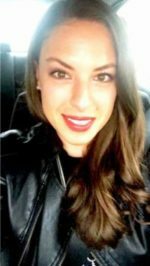 This is a great meal prep recipe. Store in an airtight container in the fridge and simply reheat before enjoying. I hope you love this recipe – please let me know in the comment section below! 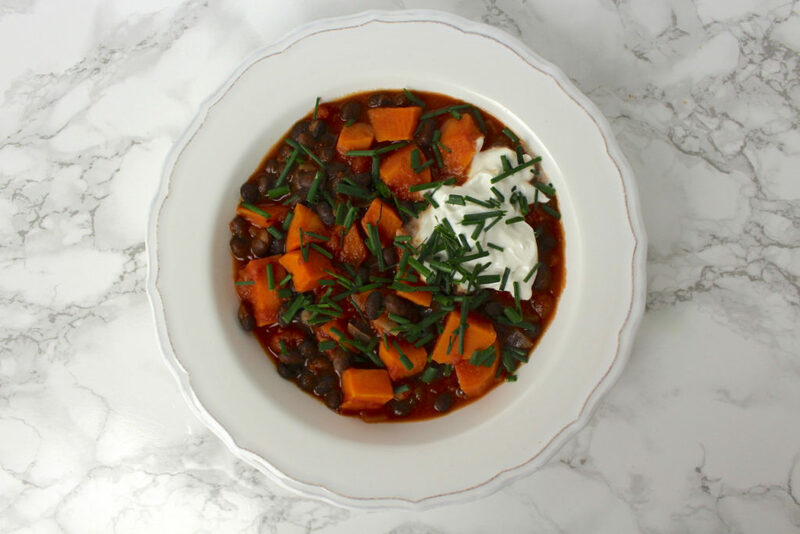 If you make this sweet potato and black bean stew, make sure to take a photo and share it on my Facebook page or on Instagram, using the hashtag #minamadefood. Oh and don’t forget to tag me (@thisisminamade) so that I can see your creations!